Personal wheelchairs and ECVs are allowed at Walt Disney World. If you choose to rent, there are several options available. Rentals are good for the entire day, across all of Walt Disney World. You do not have to pay twice for an ECV rental if you park hop, as rentals are transferable between all locations. Length of Stay ECV rentals are no longer offered at Walt Disney World. Rentals are available on a first come first served basis. Reservations are not accepted, and quantities are limited. Guests must be 18 years of age to rent wheelchairs. A photo ID is required. Wheelchairs are not designed to hold more than one person and have a maximum weight limit of 450 pounds. Courtesy wheelchairs are available to travel from parking areas to wheelchair rental locations. Wheelchairs: $12 per day or $10 per day for length of stay. 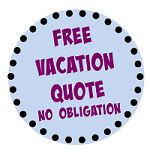 ECVs: $50 per day with a $20 refundable deposit. At Disney Springs the deposit is increased to $100. You can also rent a Wheelchair and ECV from a third party vendor. There are several Walt Disney World featured providers, these include: Best Price Scooters and Strollers, Apple Scooter, Scooterbug, and Buena Vista Scooter Rentals. Chairs from these companies can be pre-ordered and sent directly to Walt Disney World Resort hotels. There are some benefits to choosing to rent from a third party. These companies often have more chair options that may be more comfortable, they may also be cheaper than Disney rentals. 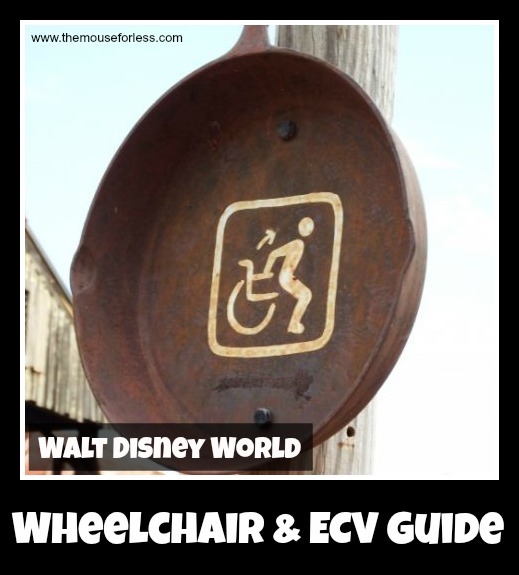 The benefit to renting from an approved Disney vendor is your Wheelchair and ECV can be dropped off with bell services at your resort, there are also many vendors not on the Disney list, the only downside is you have to be there to accept delivery of your Wheelchair and ECV. This does give you a chance to ask questions and get a mini lesson on the ECVs however. Walt Disney World is a huge resort, it feels like its own separate world. This means that there are lots of different ways to get around the enormous property. From buses to monorails, they each have their own methods of accommodating guests of all needs. Disney Resort buses are handicap accessible as long as the wheelchair or ECV will easily fit onto the bus. The size limitation is 30″ x 48″. Wheelchairs and ECVs must be firmly secured by the bus driver. Guests may remain in the wheelchair or scooter, or transfer to a bus seat. While wheelchairs and ECVs can be accommodated, there is sometimes limited space on board the bus. This means that you may occasionally have to wait to be accommodated if there are more than one or two guests with ECVs waiting for the bus. Bus drivers are typically very helpful in lowering a ramp and securing wheelchairs and ECVs. It may be useful to practice driving the ECV up ramps and practice parking maneuvers in order to make the bus boarding process go along smoothly. The ferryboat across Bay Lake from the Ticket and Transportation Center to the Magic Kingdom is handicap accessible. The Friendship boats around the Epcot resorts are generally accommodating as well. Other boats may have limited accessibility. Boat accessibility is variable day by day. The Disney World monorail system is fully accessible. A Cast Member will bring a detachable ramp to help you get on board and exit the monorail. Parking for Guests with disabilities is available throughout Walt Disney World Resort. A valid disability parking permit is required. Disney’s Magical Express motorcoaches can accommodate most Guests in standard-size wheelchairs and ECVs. You will need to indicate if you will require a wheelchair lift to board the motorcoach when booking your Disney’s Magical Express reservation. If staying at a Walt Disney World resort be sure to request a handicap accessible room. These rooms will have modifications that will make your stay much more convenient. Depending on the resort, handicap modifications vary. Resorts will be accessible without any stairs, and they will include handicap accessible showers. Some may also include doors that can be automatically opened from the inside or that will stay propped open. There may be other modifications as well. Pools at Walt Disney World Resorts are handicap accessible using a special chair pool entry system. In addition, many pools are zero entry pools, meaning a chair can be rolled right into the pool. Walt Disney World Resorts offer ramps and elevators to create an accessible environment around the resort. While all areas my not be fully accessible, most areas are available. In particular, there are direct paths from the lobby areas to resort rooms. Many Walt Disney World attractions are completely accessible without having to transfer, but others require guests to transfer from the chair into the attraction. Some attractions are much more accessible than others. Our specific attractions pages also have this information and can be accessed by visiting each theme park page or clicking the links below. The queues at Walt Disney World are mostly accessible meaning that having a wheelchair does not prevent you from waiting in the regular line. The attractions that do have a queue that is inaccessible require guests to use an alternate entrance and line. These separate queues are not always beneficial as there are generally a limited number of accessible ride vehicles and these can be slow-loading. If guests have a handicap that prevents them from waiting in lines, stop by guest relations for a Disability Access Service Pass. The following attractions require guests to transfer from and ECV to a wheelchair. Transfer wheelchairs are provided at each attraction. The following attractions require guests to walk some distance and may not be accessible for everyone. Some require just a few steps, but others include quite a bit of walking and climbing stairs. 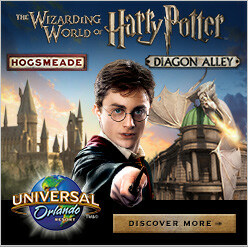 The following attractions feature and auxillary entrance that is handicap accessible. Cast members at the entrance to each attraction will direct you to the accessible entrance as well as provide any necessary instruction and answer any questions. Disney dining has many options. For table service dining, there should be no difficulty in pulling right up to the table. For other dining options or buffet style dining accommodations are available. Cast Members are normally willing to help. For buffet style dining it may be beneficial to ask for a table near the buffet line to avoid having to weave between a crowded dining area to get food. Guests in ECVs may need to transfer at certain locations where there is limited space for mobility. Being in a wheelchair and ECV can put you at a distinct disadvantage for seeing stage shows and parades. Disney provides special viewing areas that are accessible and provide a good view. These areas are roped off by cast members before the show and can only be used by handicapped guests and up to 6 members of their party. These viewing areas are available on a first come first served basis and may fill up. Cast members will be able to provide information on where viewing locations are and when they become available. Decorate your Wheelchair/ECV for special attention and fun. Bring a Towel or blanket to cover and/ or dry the chair. Bring an umbrella. Florida weather can be unpredictable, and an umbrella is beneficial rather than an impediment in an ECV or wheelchair. Ask for help! Disney Cast Members are very gracious and knowledgeable. Practice before you get there! Know how to maneuver the wheelchair or ECV ahead of time. Trained service animals are welcome in most locations throughout Walt Disney World Resort; however, they must remain on a leash or in a harness at all times. Please note that Cast Members are not permitted to handle service animals.